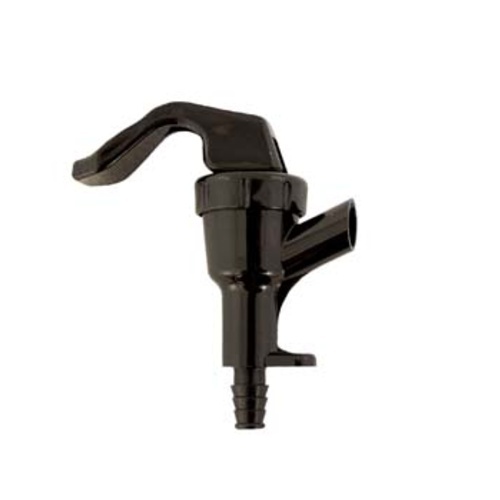 This standard, black plastic handheld faucet will remind you of the one you used to pour beer in college! A great, affordable and efficient way to serve beer at any gathering or event. Commonly called a "cobra tap" or "picnic faucet." 1/4" outlet barb. 3/16" line will fit if softened in hot water for about 10 seconds prior to assembly. The tap threads apart for easy cleaning. Please be make sure the threaded portion is assembled tight before use. I can't drink from my hands. Party Time for my friends. Gotta get the sample out of the pressurized fermentasaurus somehow. Works as expected! I have 3 kegs in my kegerator with these faucets always connected, no issues. After a couple of uses the connector between the trigger and faucet broke... Cheaply made. It works. It doesn't compare to a $100 tap handle... but it works fine. Once the beer is in the glass, the tap it passed thru on it's way seems pretty irrelevant. Maybe eventually I'll upgrade - or maybe I won't. Worthless for more than one use. I bought these as a bridge until I got my shanks and taps in. After force carbing my beer for a few days, I hooked this up so I could have a taste at serving pressure. This was late at night and I saw no leak, so I left it tapped in-case I wanted another. Well I fell asleep and woke up the next morning to all my beer in my keezer...the POS had leaked all night. This was the second time I had used this faucet. Clearly worth only one use. I love the feeling of my hard work at the bottom of my keezer. If you buy this' use it and then pull it off. I wish I would have had a better warning about that. After force carbonating, relieve the pressure in the keg, and re-pressure at a lower setting....3-5 lbs is good. If you don't, the higher pressure will likely defeat the seal on this picnic faucet. The only negative I have to say is don't put over 15 psi on this thing or beer goes everywhere! but that's user error, not the fault of the product. Bought one of these plastic faucets and on the first draw the handle came off. You can press it back on but it will continue to come off every time you push down on the lever. I bought this faucet to replace an identical one I bought at the local home brew shop. I never had a piece of garbage from more beer till now. Both must be from the same manufacturer because they both will not seal off. One dripped a puddle overnight and the other could leak a gallon per minute. I understand they are inexpensive but they should still be functional. Pulling my hair out right now. I threw a couple of these on some extra beer line and beverage out connections and it is a cheap and efficient serving means when friends want me to bring over a large amount of homebrew for any events. A good backup to have when kegerator taps are temporarily out of commission for some reason but you want the beer to keep flowing.